Price Asymmetry in Energy Demand Models: A Proxy for Energy-Saving Technical Change? It has become fashionable to believe that energy and oil demand respond asymmetrically to price increases and decreases. Unfortunately, the asymmetric price model utilized by Gately and others has the unintended by-product of producing intercept shifts in the demand function purely in response to price volatility. Thus what is in fact energy saving technical change is attributed to price asymmetry. The two become observationally equivalent. Furthermore, the asymmetric price model has the peculiarity of being dependent on the starting point of the data period so that parameter estimates are not robust across different sample periods. We demonstrate empirically using a panel of OECD countries for oil and energy demand that symmetric price responses cannot be rejected after explicitly controlling for energy saving technical change within a fixed effects model. This paper examines the relative performance of electricity distribution systems in the UK and Japan between 1985 and 1998 using cost-based benchmarking with data envelopment analysis (DEA) and stochastic frontier analysis (SFA) methods. The results suggest that the productivity gain in the UK electricity distribution has been larger than in the Japanese sector. In particular, productivity growth accelerated during the last years when the UK utilities were operating under tightened revenue caps. It also suggests that efficiency scores are higher for UK utilities. The findings also highlight the advantages of using multiple techniques in comparative analysis and in incentive regulation. This paper examines the options of transporting Russian gas to Western Europe, an issue that has thus far been dominated by a single transit country, Ukraine, which has recently witnessed substantial political turmoil. The completion of a new transit corridor through Belarus in 1999, the so-called Yamal-Europe pipeline, has modified the situation profoundly. The paper develops a model of different strategies of Russia and Ukraine, and derives the analytical solution for Russian gas exports to Western Europe, prices, and the expected profits for the players; we also calibrate numerical results and perform simulations. It turns out that Ukraine suffers a loss from the market entry of Belarus, Russia�s profits significantly increase, and Russia has an incentive to expand its gas transit capacity through Belarus further. The gas price for West European importers falls in the case of cooperative behavior of Russia and Ukraine, and/or new pipeline construction through Belarus. However, both developments would also imply a higher European import dependence on Russian gas. The Role of Energy in Productivity Growth: A Controversial Issue? The main objective of this paper is to clarify the controversial role of energy in productivity growth. This is done by reconciling conventional approaches to the measurement of aggregated productivity growth with the microeconomic foundations provided by the energy economics and frontier productivity measurement literature. The use of Malmquist productivity indices allows us to broaden previous research by decomposing productivity growth into technological progress and technical efficiency change as well as analysing the relationship between energy and both sources of productivity change. By doing so, our findings are that energy indeed matters and that the consideration of technical efficiency contributes to a better understanding of both the temporal evolution and cross-country variability of aggregated productivity growth. This perspective paper reviews and critiques the policy analysis and modeling of future natural gas markets in the National Petroleum Council�s 2003 natural gas study (NPC Study). The NPC Study provided an important and timely review of long-term natural gas supply, demand and potential policies to increase supply or suppress demand. However, its long-term scenarios used assumptions and simplifications that led to understating likely longer-term market reactions to higher natural gas prices, which results in exaggeration of the potential benefits of the policies recommended by the NPC. In addition, the narrow scope of the NPC Study did not address many important considerations in natural gas policy, such as the costs of recommended policies, or their impacts on taxpayers, resource owners, or the environment. Overall, the study does not provide the evidence needed to justify major natural gas policies, especially in view of the current uncertain market environment. Interest in the potential for natural gas to emulate oil as a �global� commodity has grown. While international trade in natural gas in liquefied form has occurred for roughly 40 years, natural gas transactions largely take place in local and regional geographies. Growing demand among large consuming nations relative to global distribution of natural gas resources makes for a compelling story with respect to international, transoceanic trade outlooks. 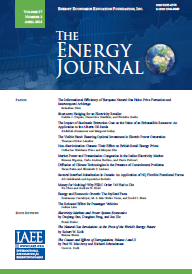 However, natural gas and the natural gas �value chain� are imbued with unique characteristics that require careful consideration by developers, researchers, regulators and policy makers. This article provides an overview and suggests key questions and issues for further research.